In a non-stick pan, sauté onion and garlic in vegetable oil over low-medium heat until translucent and fragrant. Add tomatoes and cook for another minute over the same heat. Add lean ground pork. Cook over medium heat until it is opaque and breaks into small bits and pieces. Roughly around 4-5 minutes. May add some water at this point. Add the carrots and peas. Season with seaweed salt and pepper. Cook for another minute. Make the eggs in a separate non-stick pan. Cook in a very soft scrambled manner. Set aside. Turn off the heat and add the raisins and honey. Adjust and season accordingly. Plating! 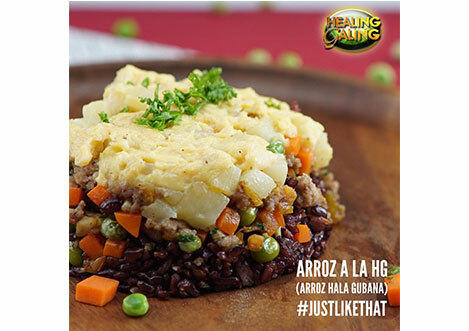 Using a ring/Square mold, layer and shape the cooked black rice – meat – banana – egg and top with freshly chopped parsley. Serve!